For years I participated in, as well as, organized, art shows. Doing shows in person meant bringing tons of artwork, setting up and then dismantling the display at the end of the day. After 8 years of shows I began investigating print on demand companies also know as PODs with the lofty goal of reaching a broader audience. I felt my photographs would be good as starter items creating three colorful collage prints. Properly re-sizing images, carefully tagging with the correct keywords, choosing store front colors, learning a bit of html and much more took over my evenings. Once those basics were somewhat mastered, I woke up one morning and discovered in my In Box, my very first “you have made a sale” email!!! of this very Sint Maarten postcard collage. My first online sale using Zazzle.com will always conjure up a tremendously exciting feeling as someone loved something I made, enough to actually make a purchase. The ultimate compliment. Sint Maarten Green Abstract Tile #4 ButtonSint Maarten/St. 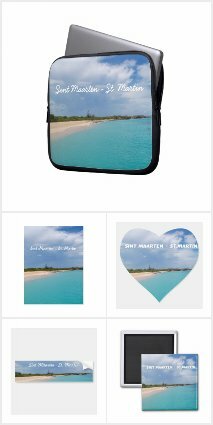 Martin - I enjoyed a wonderful island vacation and captured beautiful and vibrantly colorful images of Sint Maarten -St. Martin. My first photo was taken of the green tile in the ladies restroom of Princess Juliana International Airport with a little bit of abstract design added to it. Sint Maarten - St. Martin Seascape Wall Sticker. Stunning view of the Caribbean ocean over a flower laden white picket fence in Sint Maarten - St. Martin.